73 years ago, an extraordinary thing happened. 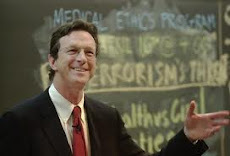 Michael Crichton was born in Chicago. For many of us, that event would affect our lives in unimaginable ways. Crichton's work is still sparking new interpretations. We had the release of Jurassic World this summer and we'll be looking forward to the HBO remake of Westworld. And check out the changes on Michael Crichton's official website. The folks over there have done an extraordinary job in remaking the website. Thank you for reminding me to vosit the official site more often!